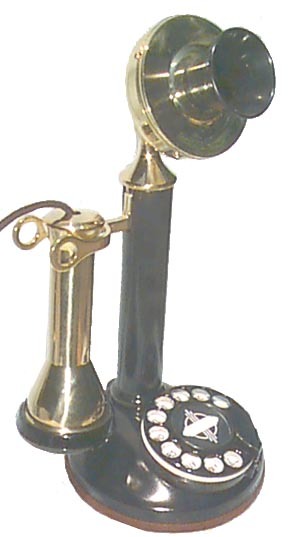 This is the same reproduction phone as the BS24 except that it is except the stem and base are painted. Most phones then were painted. This phone uses the same quality materials as our other reproductions. The kit form of this quality reproduction contains the same parts that we use to build this phone. The kit comes with easy to follow instructions and will be a very satifying project for the handy person. Without wishing to pick on anyone I would like to note that these candlesticks have been put together by young and old, men and women. The only ones that seem to have any problems are either attorneys or engineers. Over 95% of the problems we have had the person has had one of these two occupations. Nobody else seems to have any problems.